The cuisine of the Indian subcontinent is a favorite around the world and though the authenticity may (or may not!) vary, wherever you find yourself—at home on a Friday night or abroad and looking for comfort food—chances are you can comfortably pick your favorite dish off the menu. 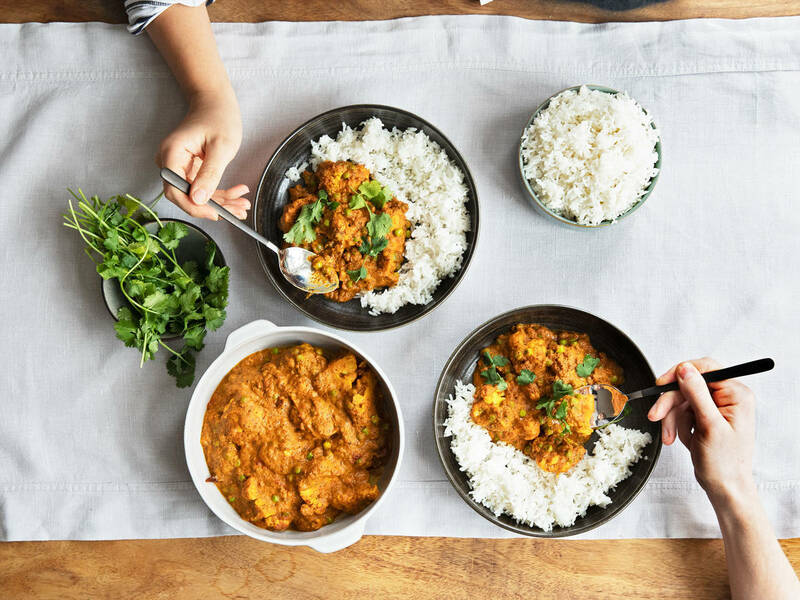 Whether it’s a masala dosa, butter chicken, or palak paneer—I’m going to state the obvious: Why not get one step closer and cook your favorite dish at home? Our easy-to-follow recipes riff on the originals to help you create tasty weeknight dinners—and our community recipes give you insight into treasured family recipes. Don’t be daunted by the amount of spices in an ingredient list—instead, think of all the flavor you’re building! To avoid constantly running to the store with each new recipe you try, here are our suggestions for the essential spices to stock your pantry with: an all-purpose curry powder, cumin seeds, coriander seeds (they can be used whole or ground), turmeric, garam masala, chili powder, and cinnamon. Other useful spices are cardamom pods, mustard seeds, fenugreek seeds, nigella seeds, and fennel seeds. A staple in the UK on Indian restaurant menus where it’s considered a national dish, the origin of chicken tikka masala is much disputed, claimed to be ‘invented’ either in the Indian subcontinent, or in Glasgow, Scotland at a Pakistani restaurant. Wherever its birth place, the creamy, yogurt-steeped dish is a worldwide favorite. Like with most flatbreads, you won’t need to wait for this dough to rise, making naan a simple addition to dinner and a fun group task. Now that you’ve mastered a basic naan recipe, it’s time to stuff it with cheese or spiced, ground lamb. Dosas are a thin, crispy pancakes made from a lentil and rice flour typically eaten in Southern India and Sri Lanka. Stuffed with a filling like spiced potatoes or paneer cheese, they are also eaten plain with a variety of chutneys on the side. Try this simplified, twist on the classic. Creamy paneer is a delicious, vegetarian-friendly cheese that can be fried or added to substantiate a curry—and indeed was the highlight of my teenage vegetarian years. I am particularly partial to palak paneer (you might know a similar dish called saag paneer) which pairs paneer with complementary, earthy spinach. It’s snack time. This recipe for pakora, Indian vegetable fritters, was submitted by KS community member fatima sameena sharif. The fritters are made by dredging vegetables in a batter spiced with nigella seeds, garam masala, cumin, and chili powder. Fatima suggests serving pakora with green chutney or hot sauce…but can’t promise they will make it far from the frying pan. This KS community recipe for a spiced, vegetarian cauliflower dish is by swarnavadlamani and uses the the fragrant spice mix panch phoron, a mix of cumin, mustard, nigella, fenugreek and fennel seeds—often used Bangladesh, East India, and Southern Nepal. It’s a satisfying option for a mid-week dinner, just add basmati rice! Though it supposedly dates back only to the 1950s, when it was first served at a restaurant in Delhi, butter chicken is a firm restaurant favorite. Though it doesn’t actually contain butter per se—it gets its name from the richly creamy and tangy sauce. Our weeknight version of the classic is here to help you out! Another community recipe from fatima sameena sharif, this time for chicken ‘malai boti’ skewers from Pakistan. The chicken becomes tender and steeped with flavor in a marinade made with yogurt, lemon, and spices. Is it a dessert, a starter, or something to sip alongside a meal? For me, it’s been all three. I never don’t order a lassi, and I therefore never leave an Indian restaurant not bursting at the seams from curry, rice, maybe a Peshwari naan, maybe a bhaji, maybe a jalebi, and said lassi. Best of all, you can make an equally filling, sweet and tangy lassi at home—sub the mango for rose syrup and a punch of cardamom to create my absolute favorite yogurt-based drink.